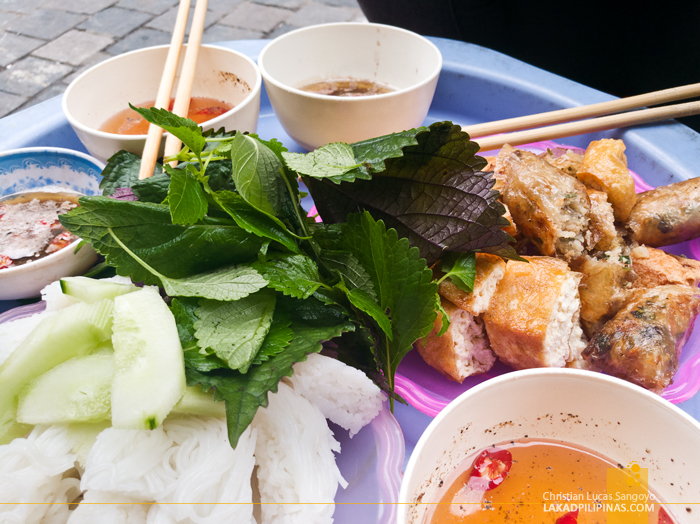 On our second trip to Hanoi, Vietnamese street food, again, became our staple for our everyday gastronomic needs. 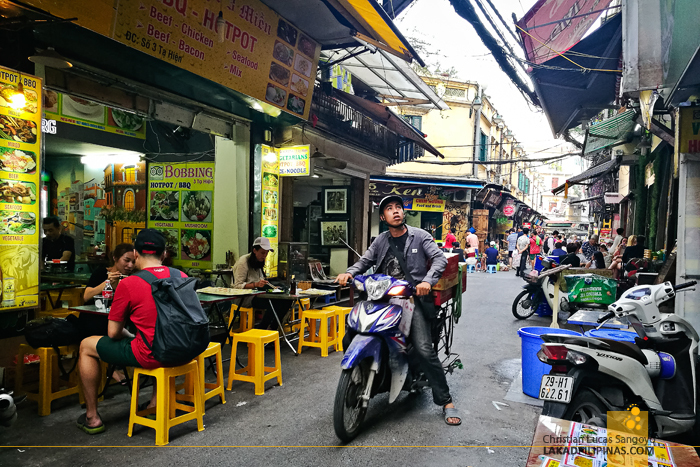 From our arrival from the Imperial Citadel of Hue, to our departure going back to the Philippines (where Jollibee awaited), we ate on nothing but the cheap eats found on the sidewalks of the city. Definitely no fancy restaurants for us! I was originally planning to include these on my previous Hanoi food trip article, but the variety of Vietnamese food is just too overwhelming, so I’m posting this separately! 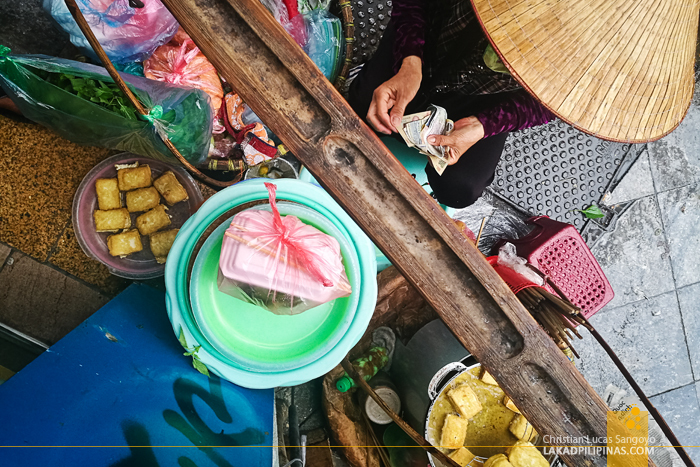 We started off on the street hawkers balancing two baskets filled with tofu, spring rolls, rice noodles, cucumbers, and greens on a bamboo pole off their shoulder. Bun dau mam tom is dubbed as one of the smelliest food in the country, these are usually sold by old ladies wearing traditional Vietnamese nonla hats on the sidewalks. 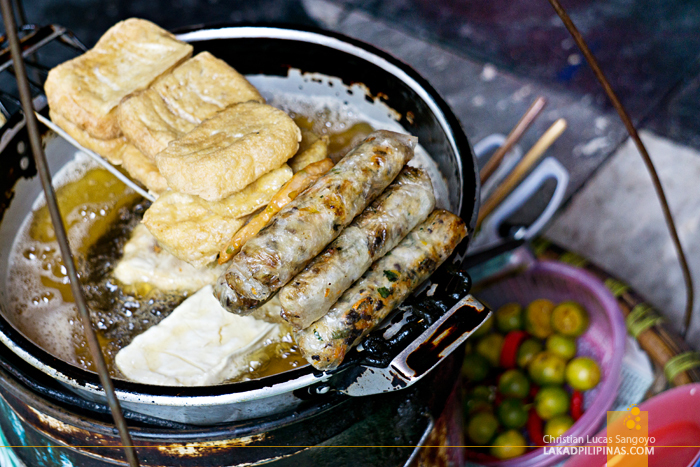 Having no idea what these are, the first one we tried, we bought only fried tofu and spring rolls, pairing it with strong Vietnamese ca phe and banh mi on a nearby café. Little did we know that we were supposed to be eating it with rice noodles and some leafy greens, and dipping it on vinegar or watery shrimp paste sauce! This dish is definitely not for everyone, the shrimp paste is overpoweringly strong, both in taste and smell, but if you’re a Filipino, it isn’t that weird as we have our own bagoong to contend with it. I cannot count the number of times we ate pho while in Hanoi. 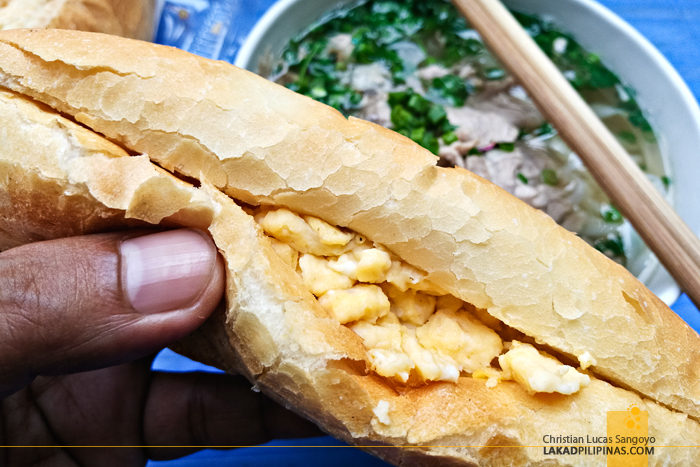 While we usually pair the scalding hot noodles with banh mi, it was kinda hard to find banh mi stalls in Hanoi, especially during the mornings. 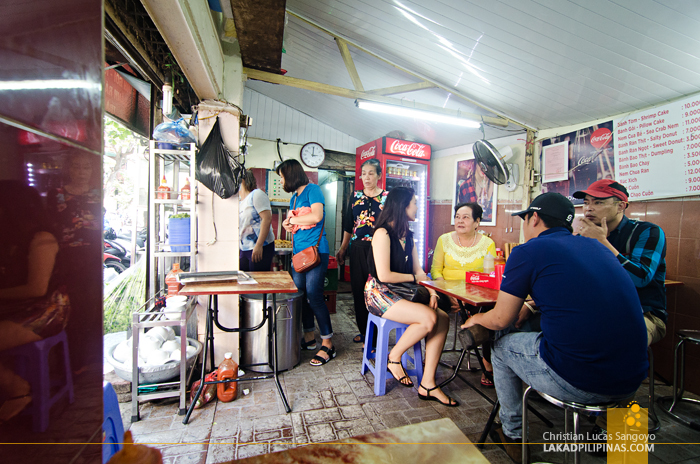 Good thing our lodging, Cocoon Inn Hostel, serves one during breakfast, so what we usually do was take those outside to the aunties hawking pho off the diminutive stools along the sidewalk. 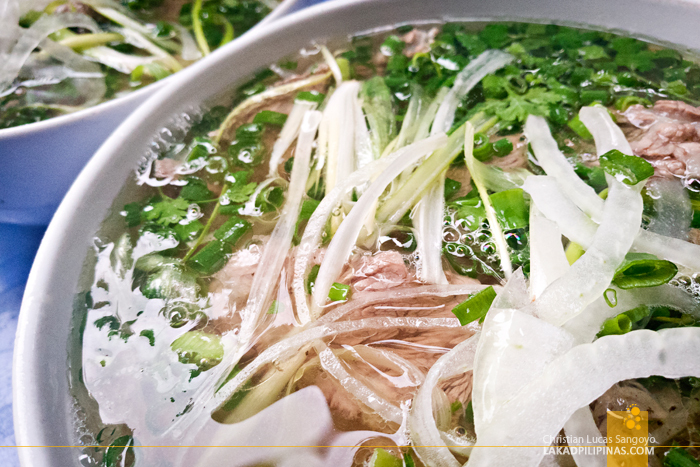 If you’re not familiar with pho, which is quite impossible, it’s a noodle soup dish popular all over Vietnam that uses vermicelli noodles mixed in with meat, bean sprouts, onions, scallions, and lots of leafy things like cilantro and spearmint. A bowl of pho around Hanoi is really cheap considering a single order is already good enough for me and C. One can have it with chicken which they call pho ga, or with beef which is pho bo. We usually go for the latter. And with too much pho and rice noodles comes the craving for an actual rice meal. Well, for C at least. 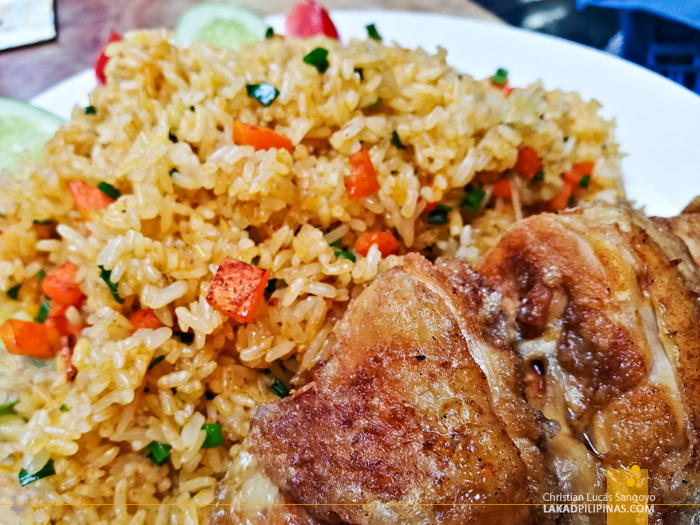 So on one of our meanderings along Ta Hien Street, we ducked on one of the many food stalls along Hanoi’s walking street and ordered fried rice with, guess what, fried chicken! 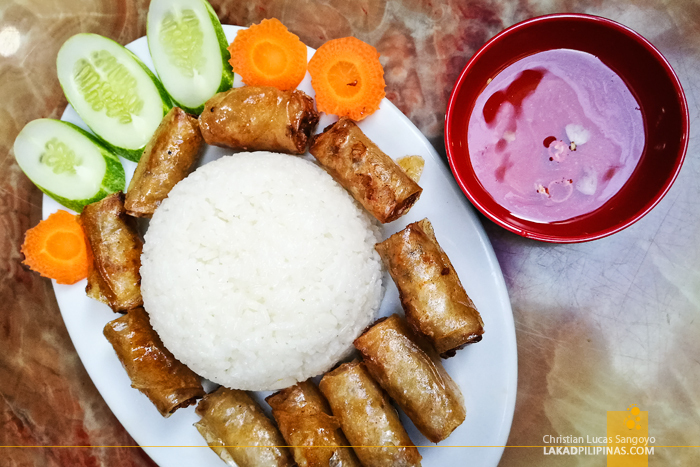 To save face, we also asked for my favorite, nem ran or spring rolls, which come with steamed rice. Since we’re on the more touristy part of town, prices were a tad higher than usual. We chose to sit on the stools set on the sidewalk, but we had to stand every now and then as the police rove the area. It was illegal for vendors to set up seats along the sidewalk, but once the cops turn their backs, like just a few seconds, all the tables and chairs come rushing back to the sidewalks. It was quite hilarious! 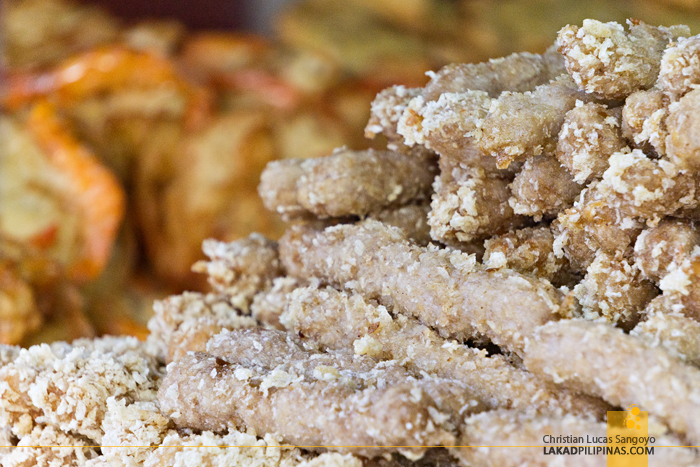 En route to the famed St. Joseph Cathedral, a stall with its windows full of what seemed like shrimp cakes caught our attention. 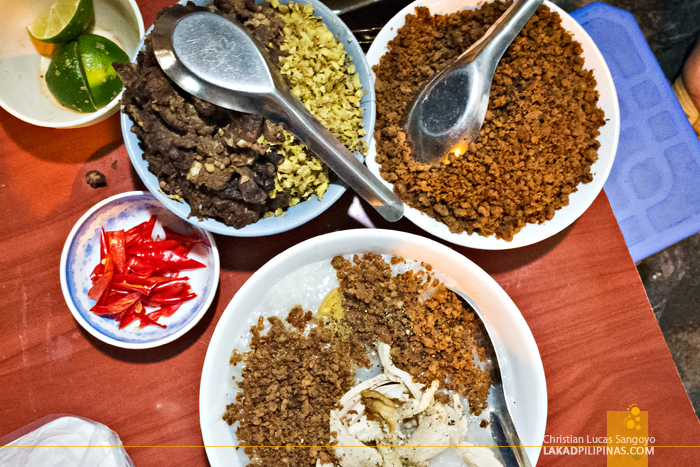 We weren’t particularly hungry, having had our fill of pho just then, but their offerings really made our mouth water, think okoy! So in we went, and guessed and pointed our way to ordering everything they’ve got. They have a menu posted on their wall but the only things we could guess was banh tom or shrimp cake and nem chua ran, which were fried pork and crab spring rolls. The rest, we Google translated as we went. 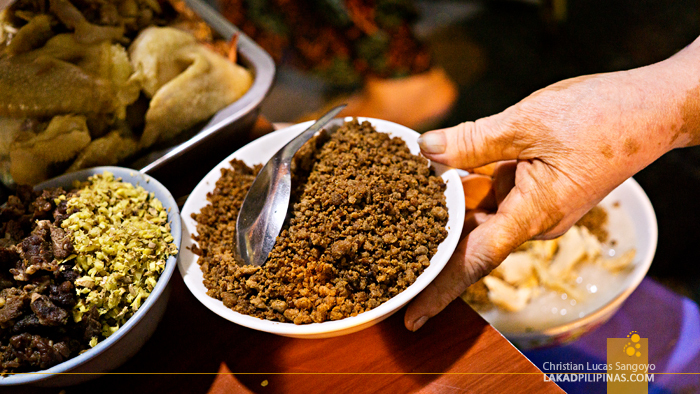 Banh goi was the empanada pillow-shaped cake filled with mushroom, glass noodles, and pork. All our orders were cut into pieces and dumped on a single big plate accompanied by a mini bowl of vinegar with cucumber, and a plastic plateful of various leaves. Their banh tom and nem ran were so good, crisply fried and very tasty, that we came back to this place on more than one occasion! It’s a rare occasion when I found myself not liking Vietnamese food. Of the three weeks that we spent in the country, that only happened once. 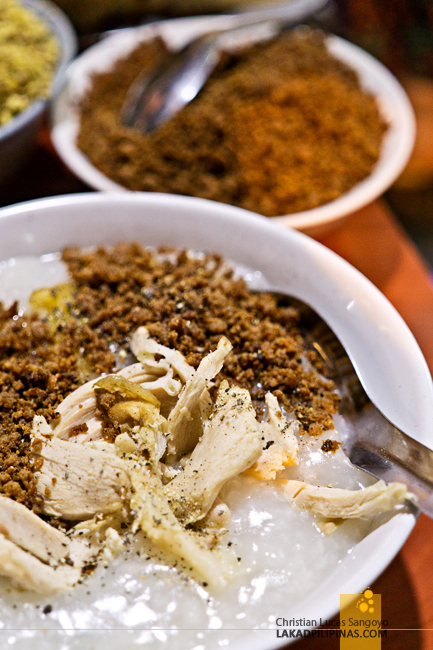 From a drinking spree along Ta Hien Street, we stopped at a stall in Hang Buom Street for recovery food of chao ga.
From those being served on their tables, it looked like the typical Filipino rice porridge or lugaw, except the grains on this one is pounded into finer bits. It’s then topped with shredded chicken, what seemed like flavored pork bits, and pepper. I’ve been wanting to have a taste of this dish, ever since seeing one in Saigon, but now that I’ve tried it, I wished I just went for a bowl of pho. The consistency of the grounded rice and the actual flavor didn’t quite agree with my taste buds. It might be that I’ve tasted a bad version of it, so I’ll be giving chao ga a second chance next time I’m in Vietnam. Our feet led us outside the Old District and the French Quarter on the last days of our stay, checking out Hanoi’s Temple of Literature and Imperial Citadel of Thang Long, a UNESCO World Heritage Site. On the way there, we passed a bun cha stall. 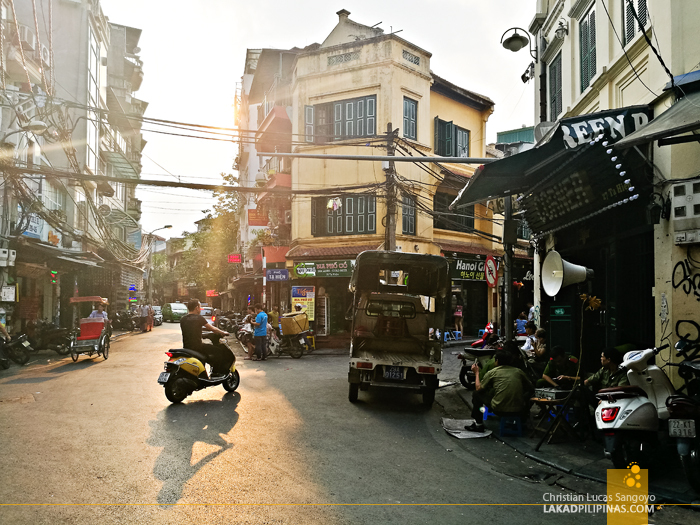 I remembered a fellow photographer recommending this to us during our first trip to Hanoi. We were unable to try it then, it was our chance to try it now. 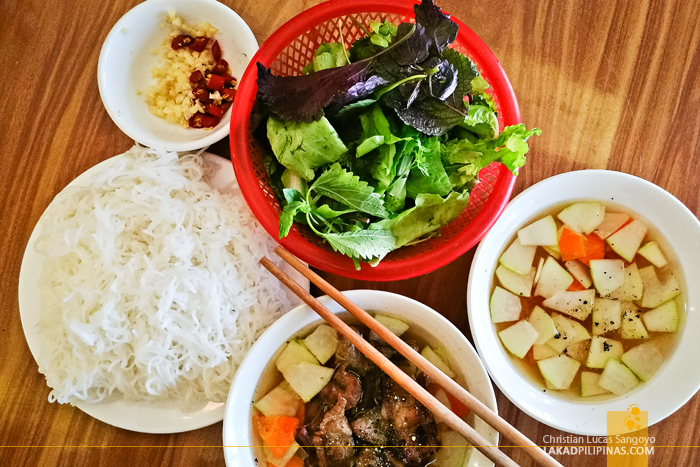 Bun cha is originally from Hanoi, it is composed of grilled fatty pork swimming on a cold slightly sweet stock with diluted fish sauce and vinegar with cucumber and carrots, dry rice noodles, leafy greens, and an extra bowl of the stock for good measure. 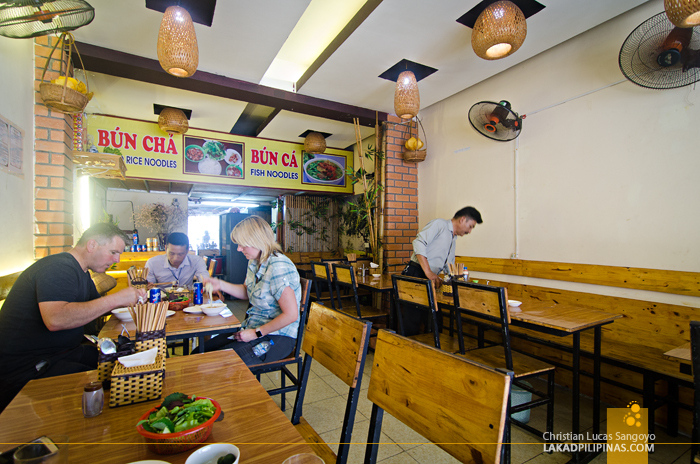 Now how to eat bun cha. Put everything on the bowl with meat, the noodles, the leaves, everything. Then eat it like a pho. That easy, lol! We ate ours with gusto. It was so good, we were devastated that we only have a few days left in Hanoi to have a go at it again. 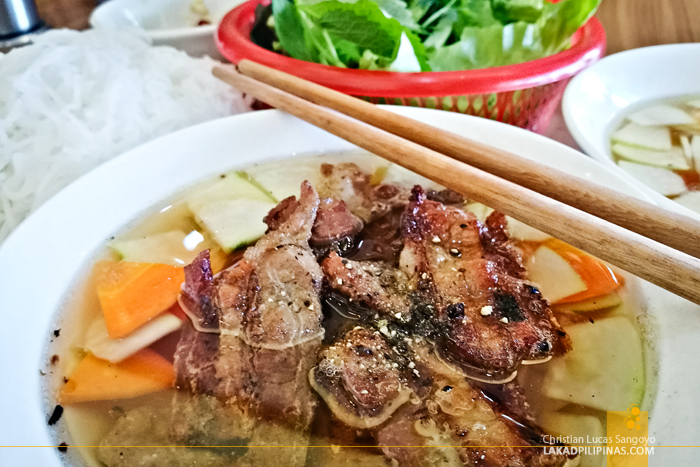 The meat was extremely tender and the broth has just the perfect mix of sour, salty, and sweet. 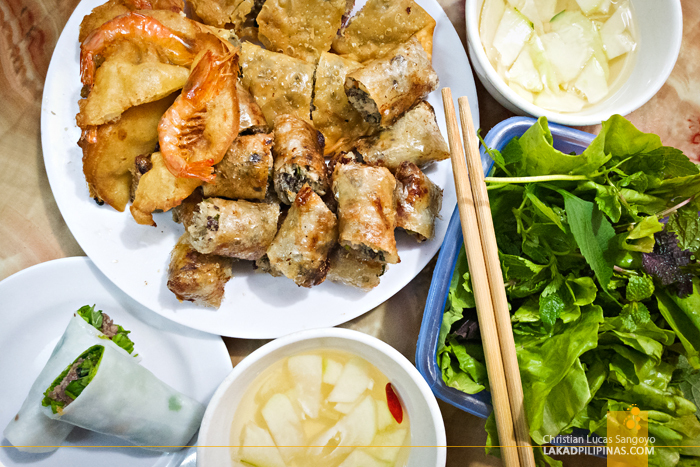 How we wish we’ve had bun cha since our first day in Hanoi! 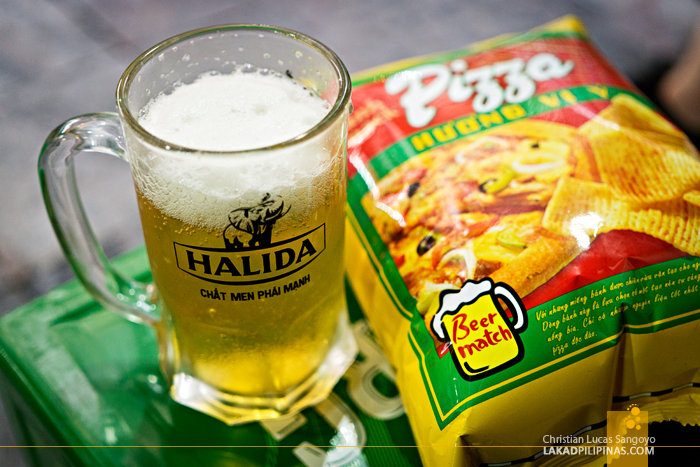 BIA HOI WITH PIZZA SQUARES BEER MATCH! 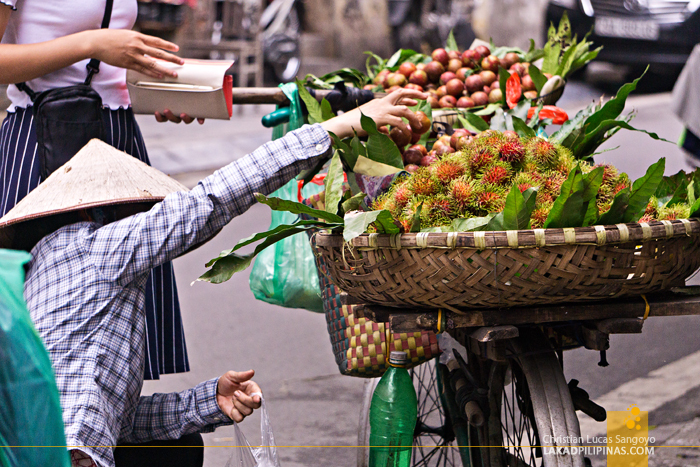 And last but not the least, our favorite drink in Hanoi, beside Bia Ha Noi, bia hoi! 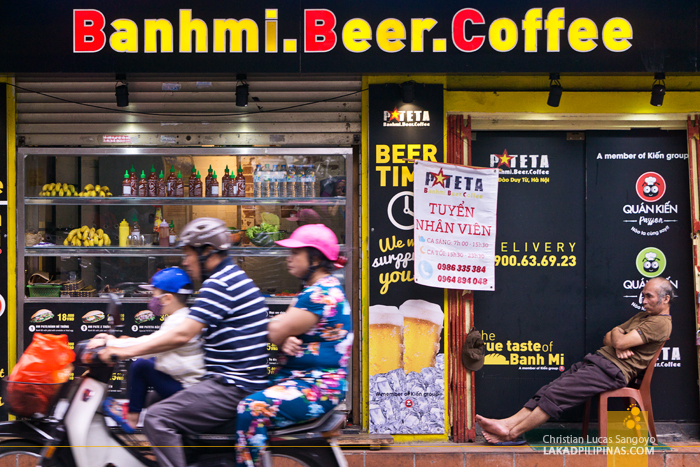 This somewhat rare beer is found only on select bars on parts of the Old District, mostly on those with low stools set up along the sidewalk. I say rare, since they usually run out of stock as soon as evening descends. Why? Besides having a good beer taste, it’s incredibly cheap! These don’t come on bottles, but rather on steel beer kegs with a tap. Just hand over your dongs, they then hand a mugful of goodness back to you. 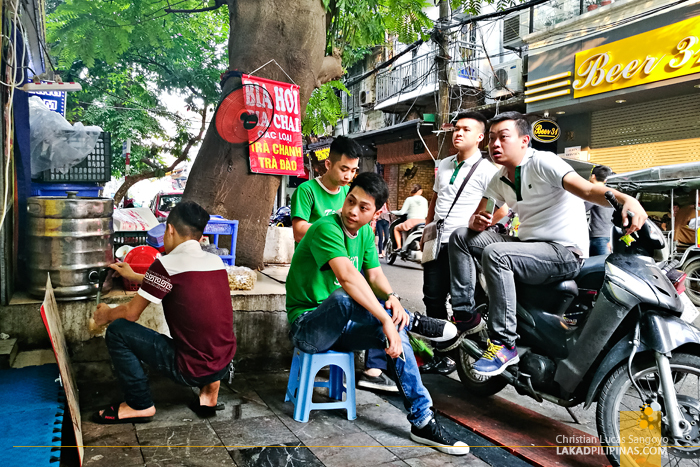 We usually have these late in the afternoon, after walking all day, on one of the small shops fronting the busy intersection of Ta Hien Street and Lurong Ngoc Quyen—our favorite spot in Hanoi.